Summertime spirit into your classroom with great Summer activities! After a beautiful spring season, summer is here. Use your interactive whiteboard to get your students involved in the last lessons of the year by introducing some fun summer themed activities. Choose from these popular Gynzy activities that cater to a variety of academic subjects and grades, and are sure to bring a little summertime spirit into your classroom. What could be more fun than a lesson about Summer? Use this summer theme board to talk about summer. This theme board provides you with information on summer topics that will be engaging and educational for you students. The Summer Scene activity is an interactive way to get your students talking about what they plan to do this summer, while also learning a little more about the seasonal activities they enjoy. Bright and engaging illustrations showing family and friends having a fun time in the sun, are combined with informative passages and photographs further explaining the scene. The features in this activity provide interesting information and help you to start a discussion in your class. 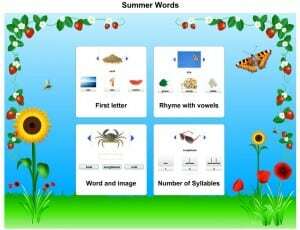 This tool offers you 4 different activities about summer related words. This tool is a grab bag of fun and challenging language arts games that feature summer friendly words. Students can work as individuals, in pairs, or in teams to find rhyming words, match the words that share the same letter, connect words to corresponding images and clap out syllables. The first activity is called ‘First letter’. Students look at the image and the matching word offered, then try to find a word in the given three examples that starts with the same letter. The second activity is ‘Rhyme with vowels’. Your student will be shown a word and its corresponding image. From three examples given, the student will then find the one that rhymes with the word shown with the image. The third activity is called ‘Word and image’ and helps practice word recognition. This activity shows an image, students then have to find the matching word. The fourth activity is ‘Word Pieces’ in which the students learn to use syllables. Students clap the number of syllables in a word, then select the correct syllable button. Put students in the hot seat and get the whole class involved with a spirited, customizable game. Create categories such as Summer words, Science, or Math. In the summer words category you can ask for synonyms for common used summer terms. In the Science category you can ask questions about health issues like sun burns, dehydration and about healthy food options for the summer; but also about more academic science topics like if an object will float or sink in the pool, or a question about the sun’s apparent path. In the Math category you can ask some questions about the costs of an ice-cream at the beach, or ask a question about summer temperatures. The possibilities are endless and the entertainment is guaranteed.